The term marine engineer can also refer to a designer who specializes in the design and building of marine machinery, and occasionally, specialists in naval architecture and shipbuilding. 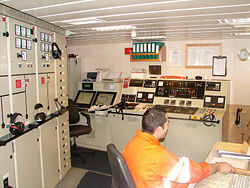 The Engine room of Argonaute, a French supply vessel. Marine Engineering is a profession practiced by members of a ship's crew who operate and maintain the propulsion and other systems on board the vessel. Marine Engineering staff also deal with the "Hotel" facilities on board, notably the sewage, lighting, air conditioning and water systems. They deal with bulk fuel transfers, and require training in firefighting and first aid, as well as in dealing with the ship's boats and other nautical tasks—especially with cargo loading/discharging gear and safety systems, though the specific cargo discharge function remains the responsibility of deck officers and deck workers. Sometimes, they are involved in the design and construction of these complicated systems, although new design is mostly included within the naval architecture or ship design. The field is closely related to mechanical engineering, although the modern marine engineer requires knowledge (and hands on experience) with electrical, electronic, pneumatic, hydraulic, chemistry, control engineering, naval architecture, process engineering, gas turbines, and even nuclear technology on certain military vessels. Marine Engineers are the members of a ship's crew that operate and maintain the propulsion and other systems on board the vessel. Marine Engineering staff also deal with the "Hotel" facilities on board, notably the sewage, lighting, air conditioning and water systems. They deal with bulk fuel transfers, and require training in firefighting and first aid, as well as in dealing with the ship's boats and other nautical tasks—especially with cargo loading/discharging gear and safety systems, though the specific cargo discharge function remains the responsibility of deck officers and deck workers. Sometimes, marine engineers are involved in the design and construction of these complicated systems. New design is mostly included within naval architecture or ship design. The field is closely related to mechanical engineering, although the modern engineer requires knowledge (and hands on experience) with electrical, electronic, pneumatic, hydraulic, chemistry, control engineering, naval architecture, process engineering, gas turbines and even nuclear technology on certain military vessels. The Marine Engineer is a bridge between the people and engineering. A ship's crew is divided into two distinct sections: those who navigate the ship and those who maintain the machinery and controls, carrying out all repair functions on-board. The navigators are deck officers and report to the Chief Officer. Engineers run and maintain all machinery, reporting to the Chief Engineer. Also on board are the crew or 'Ratings', who are 'other ranks' or hands who, though not officers, play a key role in running the ship by assisting the officers in daily operations. In the Engine department, this includes Wiremen (who assist Electrical Officers), Fitters, Motormen (or donkey greasers, depending on nomenclature) and Wipers or utilitymen who play a large role in the daily upkeep of the engine room. The original term Engineers (on a ship) meant the technical people who dealt with the engines, as opposed to the Consulting Engineer concept (their counterparts on land). Marine Engineers are generally more 'hands on', and often get dirty, sweaty and work in arduous conditions with temperatures in the engine room spaces exceeding 45-50 degrees Celsius (122 degrees Fahrenheit). Patience and a logical approach need to be maintained at all times, especially when dealing with heavy machinery in a seaway. There are four classifications of Marine Engineering licenses throughout the merchant marine, those being Chief Engineer, First Assistant/Second Engineer, Second Assistant/Third Engineer, and Third Assistant/Fourth Engineer. Those who join without experience are Fifth Engineers / Trainee Marine Engineers (TMEs) or Junior Engineers. Those who join without an engineering license are given the rank of Engine Cadet. Engine Cadets usually only work under the supervision of a watchkeeping engineer. They are mostly only day workers and are usually given one day off per week to study for gaining their licenses. Engineer Officers bear the same number of stripes, on cuffs and on epaulettes, as Deck Officers with the complementary rank. For instance, a Chief Engineer bears four stripes, as a Captain does, but they are distinguished by the cuffs and epaulettes bearing the Engineer's blue or purple between the stripes. There is a popular legend that engineers wear the color purple, granted by the King (royal purple) in honor of the RMS Titanic's engineers who never abandoned their stations and went down with the ship. But that colorful story is not quite correct, for such an insignia has been worn by Royal Navy engineers at least since 1864. A more probable origin dates back to the 1830s, when Joseph Whitworth invented the method of making truly accurate flat surfaces, by using Engineer's blue—a highly pigmented paste. The method is also used for testing bearing and journal surfaces. It may be this color that engineers wear. A different means, of differentiating Engineering officers from Deck officers, is by the insignia above the stripes. In some merchant fleets, a propeller is located above the Engineer's stripes, whilst an anchor or a diamond is located above the Deck officer's stripes.